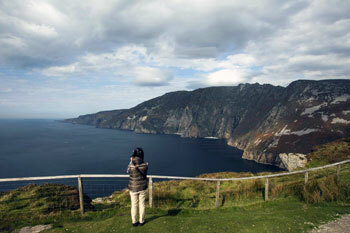 The first thing that you will notice when you arrive in Ireland is its stunning natural beauty. The Irish countryside really does offer forty shades of green and an abundance of exceptional landscapes. Having recently returned from a trip abroad, the first thing that hit me was the beautiful lush green fields that surrounded me as I travelled down the road and I realised how much I had missed Ireland’s natural beauty. The one thing that we take for granted living in Ireland is its jaw-dropping beauty. It is home to natural phenomenon that you just won’t see anywhere else in the world! Locations throughout Ireland such as the Giant’s Causeway in Northern Ireland, The Burren in County Clare, Sliabh Liag Cliffs in County Donegal, The Copper Coast in County Waterford, the Wicklow Mountains National Park, and the Beara Peninsula in County Cork will astound you and as far as these magnificent places go, the list is endless. The Wild Atlantic Way on the West Coast of Ireland is the longest defined driving route in the world. It spans nine counties and is truly breath-taking with so much to see and do. 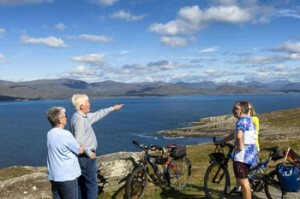 In Ireland, you are spoilt for choice, from beautiful landscapes that are perfect for outdoor adventures such as walking, cycling, golf and horse-riding, to a coastline made for surfing, sailing, fishing and more. There are mountains to climb and parklands and woodlands to explore, all offering something that little bit special. Ireland has no less than six National Parks including, Killarney National Park known as the “Jewel in Kerry’s Crown”. This park alone is famed for its beauty and is home to Macgillycuddy Reeks (Ireland’s highest mountain range), Ross Castle, Muckross Waterfall and the Lakes of Killarney. Farmhouse bed and breakfasts are located across Ireland and offer modern and comfortable accommodation, yet retain the old traditions that make them so unique. You have the option of taking part in farming activities or to just sit back and enjoy the tranquillity and peace of your beautiful surroundings. They are the perfect base for exploring Ireland’s undeniable natural beauty. Book your Farmhouse B&B now!